Even though it’s been addressed by a lot of professional SEO experts, including Google’s Matt Cutts, this is still a question we get a lot. So let’s review it in detail what the difference is between curated content and duplicate content. Content is duplicated when similar content exists on 2 or more different URLs. This can happen on your own site with only original content if your Content Management System (CMS) isn’t configured in the right way and creates artificially new URLs for existing content. For instance if a blog post can be found through 2 different URL paths – something that can be addressed by using canonical URLS as explained by Google. Another example – this time across domains – is when you syndicate content as Google will see 2 or more exact same posts at different locations. For instance, if you have an industry website syndicate all of your content through its RSS feed or if you republish your own post on Medium or LinkedIn. Note that in both cases, we’re talking about duplicating a significant part or the entire content to another web page or to another site. It’s like saying: “I don’t care what this content is but it seems to work so let’s copy and paste it to our blog.” That’s not what content curation is as we’ll see below. But first, let’s look at why Google doesn’t like duplicate content and what it does with it. Not necessarily, says Google. As Matt Cutts explains: “It’s important to realize that if you look at content on the web, something like 25 or 30 percent of all of the web’s content is duplicate content. … People will quote a paragraph of a blog and then link to the blog, that sort of thing. So it’s not the case that every single time there’s duplicate content it’s spam.” Spam. That’s the important word here: the point Matt Cutts makes is that Google’s objective is NOT to prevent one website from quoting another one – a practice which has been going on since the invention of the World Wide Web and which is at its core through the hyperlink. But, he adds, “It’s certainly the case that if you do nothing but duplicate content, and you are doing in an abusive, deceptive, malicious, or a manipulative way, we do reserve the right to take action on spam.” So if you’re doing nothing but that (if you’ve automated the process without applying any curation) and you’re doing it to deceive Google, you’re in trouble. And should be. So Google recommends to syndicate carefully. In our own experience republishing to Medium, LinkedIn and other sites, we had great results in Google Search but we used different titles for each destination. 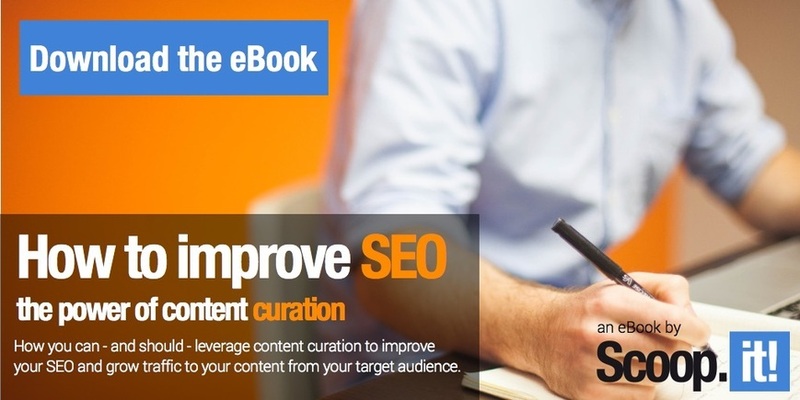 How is Content Curation different? Though content discovery can be automated (and should be as it’s time consuming), Content Curators apply judgement before selecting what they publish. They also add context by adding value to their audience by telling them what it means for them. It’s like saying “Oh! I’ve read this piece of content and it’s really interesting for my prospects because it answers a question they often have in our commercial discussions.” Let’s make this visual through a slide of our guide of content curation benefits for SEO: So not only is the intent completely different (spamming vs educating) but the implementation is also very different – an implementation which is built in if you use a professional content curation platform like Scoop.it where all the above elements of a good curated post will be built-in: source attribution and link, short snippet (our system for instance limits it to a few words or the first sentence) and the ability to add an insight, one of our signature features that enables you to add context and value to your audience. But more fundamentally, you can see that in the above curated post, the original content is not duplicated: a sentence or two can be quoted but the original content has not been copied / pasted to create the new post. 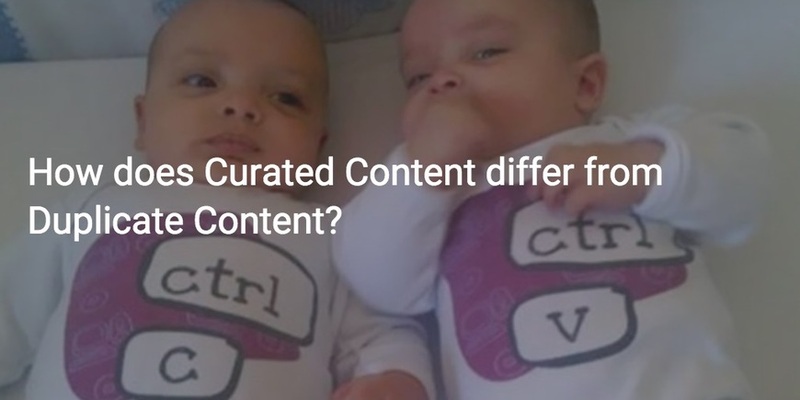 7 Comments on "How does Curated Content differ from Duplicate Content?" Sitting here going over some business goals and objectives and doing a little research, when wham, I read your article. Perfect timing! Thank you Guillaume. I will have to read it a couple times more because of all the important points, and I will also have to recommend this to other curators for reference. Very clear the explanation on the duplicate content. Had several questions in this regard but with this explanation remains me more than clear. Jason, if you still grapple with duplicate content I recommend using http://copyact.com/ where you can actually save you website and allow the tool to crawl your content on a regular basis. You just need to provide your website address and will get reports on email any time a duplicate content is found. I protect multiple websites this way and assure you, it’s the most convenient way to search for duplicates. Yes. Business Insider or even the Huffington Post are also great examples. New media outlets are not producing 100% of their own content anymore so why should marketers? As per Google’s Matt Cutts quote above, you could end up hurting your SEO by systematically using duplicated (not curated 😉 content. Occasionally doing it is not a problem but to be safe, use curated and not duplicated content.